Over 85 countries and NGOs gathered this week for the conference “Supporting the Future of Syria and the Region”, in an attempt to revive peace efforts and bolster financial support for humanitarian aid to the war-stricken region. 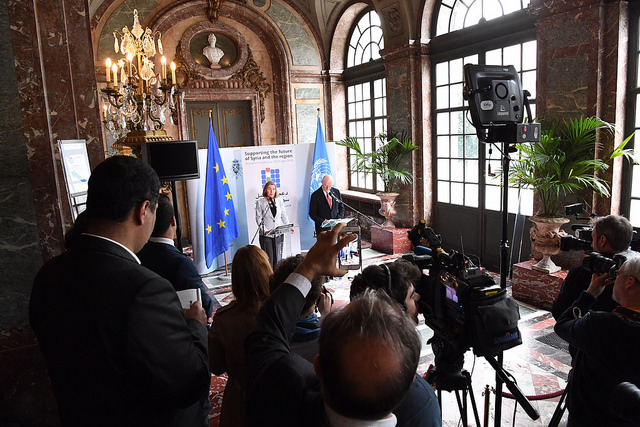 Jointly chaired by the United Nations and the European Union, the two-day Conference followed on from the first Brussels Conference in April 2017. The UN has said that over $8 billion is required to provide adequate support, however this year’s pledges amount to just $4.4 billion. The first Conference in 2017 saw international donors pledge $9 billion for humanitarian, stabilisation and development programmes in Syria and neighbouring countries. The EU is the largest international aid donor to the Syrian conflict, having pledged €10.64 billion to date. These pledges will be sustained for this year and the coming year. However, while welcoming the commitments by countries during the conference, aid agencies have warned that they are still severely underfunded in trying to meet the “staggering needs” of over 13 million internally displaced Syrians. Now in its eighth year, the conflict in Syria has claimed hundreds of thousands of lives and devastated millions more, with five million refugees hosted primarily in neighbouring countries. European Union Foreign Policy Chief Federica Mogherini stated in a press conference, “I believe that we can say we identified common ground on at least two or three issues. One is that there is no military solution to the war in Syria. The second element is the key role of the United Nations in leading this political process. And the third element in which I have seen a consistent level of convergence is the need to support Syrians and Syrian civil society”. NGOs have called for States to take urgent action in order to respond effectively to the atrocities committed against the Syrian people and to bring humanitarian assistance to those desperately in need. Head of UN Aid Agency UNOCHA Mark Lowcock said, “What we’ve had today is a good start. In an ideal world, we would have liked to have raised more money and have our appeal fully funded, but we’ve made a good start. The right thing to do is to focus on the most vulnerable and those most in need”.